When I first put out information about the 11th Avenue Buddha that I have had time to check my records, I found that Lu and I installed the Buddha in 2009 as an experiment to see if we could change the energy of our corner divide and keep the garbage and mattresses from being dumped there constantly. At that time we were calling the city at least twice a week reporting illegal dumping. It usually took them a week or two to do a pick up and by that time another load had been left because the exiting pile was like a magnet for continued dumping. Besides the illegal dumping there was constant graffiti tagging which the city seldom did anything about. Another neighbor and I traded off cleaning it up. Add to that the drug activity and the urination problem and the traffic divide was a mess. So I went to ACE hardware and found a concrete garden sculpture of the Buddha and brought it home. He sat in our basement for several weeks because I had to figure out how to install it so no one could steal him once installed. This is Oakland after all. Once I came up with a plan we installed the Buddha. The Buddha sat there for several months and slowly we noticed slight changes in the garbage environment. The garbage and mattresses didn’t stop arriving but the dumping occurred on the other end of the street divide from where Buddha sat. Buddha just sat there and never said a word. Within the first year the graffiti was reduced by 50% and the drug and urination problem was lessened as well. And all the Buddha did was sit there. It was well into the second year that someone painted the Buddha a beautiful soft white and a short time after that offerings started to appear. At first, oranges and pears. Then flowers and candy. And then large flower arrangements and bowls of fruit and finally the incense. For a long time I did not see anyone bringing the offerings. They just appeared. Along with all this new activity the area continued to change and the illegal dumping all but disappeared. Many neighbors started to pick up and clean the area more. And due to people being present at different times of the day the drug and urination problem ended. Buddha just sat there saying not a word. As time passed the immediate neighbors and extended neighborhood tended to stop and view the Buddha. Whether they were walking their dogs or taking an evening stroll they would stop and seem to ponder and many times get into conversations while viewing the Buddha. People talking to each other. The Buddha just continued to sit there and never saying a word. 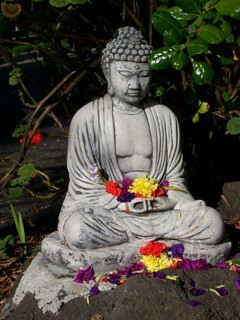 About two months ago a Vietnamese fellow and his wife came to our door and asked if I would mind if he put a little house around the Buddha and I informed him that I had no issue with that and that he didn’t have to seek our permission because the Buddha we installed was a civic Buddha and didn’t belong to us but to the community. Since then people come and pay their respects to Buddha in large numbers throughout the day. They sweep and tend the area everyday and their presence creates a people presence which in many neighbors’ minds makes the neighborhood feel safer. Lu and I are not Buddhists and we installed this Buddha because we felt that he was a neutral being that denotes compassion, brotherhood, and peace. The fact that our experiment has proven more successful than we had ever imagined is a wonderful thing for us and our neighborhood. And to think that this Buddha has just sat there all this time and never said one word. Contemplate that! Recently because of the increased activity around the Buddha someone called the City Public Works Department to complain about its presence. It was a Monday morning when a neighbor called me and informed me that a Public Works supervisor from the City was in the neighborhood looking for information about the Buddha so I came out to see what the problem happened to be. The supervisor informed me that the Buddha was going to be removed because an anonymous (single) complaint had been made about the Buddha. The supervisor explained that if I could get hold of the people who had installed the Buddha and have them remove the little house and the Buddha beforehand, his crew wouldn’t have to come out and dismantle it and throw it away. I explained to the supervisor the history of the Buddha related above but he said that the Buddha would have to be removed. He also informed me that if mattresses and garbage appeared again after the Buddha had been removed that I had his assurance that the City would come out and pick them up. The Buddha just sat there across the street from our conversation and said not a word. It wasn’t more than five minutes from the time the Public Works supervisor pulled away in his new clean pick-up truck until I was on my computer asking for help from the neighbors and the community as a whole to help save the Buddha. There has been a remarkable outpouring of letters of heartfelt support asking for the Buddha to remain in his place undisturbed. The Public Works Department with the input of City Councilwoman Pat Kernighan, halted the dismantling of Buddha in order to “study the situation”. This is a step in the correct direction. With all that Oakland needs to do to improve community just maybe not attempting to dismantle what is working may be a good starting point. For the time being the Buddha is just sitting there and he hasn’t said a word.